I tend to be really cautious about handling venomous snakes. Pit vipers are scary because you just never know when they’re going to strike. They’re very calm until WHAM a strike from nowhere. I think as soon as they get a good lock on the part of your body giving off heat – it’s almost an automatic strike. I’m not sure they decide anything at all – just strike like lightening. I never handhold the pit vipers. I headed up to a remote part of the wat (temple) today to see if maybe I could spot a snake. So far at that temple I’ve found a Rhabdophis subminiatus – Red Necked Keelback, a Painted Bronzeback, a 4 meter King Cobra, a Mock Viper, and a brown Keelback. Oh and a green Ahaetulla prasina – Oriental Whip Snake. There has been a lot of rain lately and the day was really hot – which is a change from the cooler temps of late, so I thought I’d see what I might find. I walked the 90 steps up and 100+ down into the valley – the foothills, and started along the path. There was some loud noise to my right. I walked over there to find a skinny Thai guy – probably a bit mental, or hungry, trying to kill a big box tortoise. He had a snake in his left hand – I was like WTF? That’s a VIPER. I said to him – Ngoo Pit (snake is venomous!). He insisted – Mai Pit! (not venomous) over and over… I said, “Gep Ngoo, ROO JACK – NGOO NEE – PIT!” Translated – I collect snakes, I KNOW THIS SNAKE IS VENOMOUS. 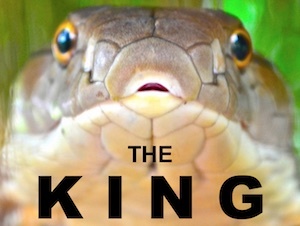 He puts the snake up to his face and cheek, where it bites him on the cheek. I think – what an idiot! 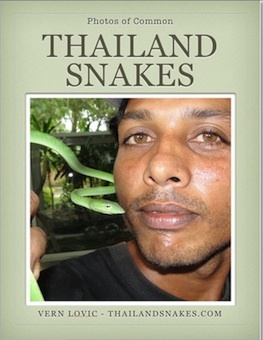 I say – “Can I have that snake?” (in Thai of course). He said OK. I offered to pay him for it – he said – 100 Thai Baht. I said – great. I took the snake into a plastic bag and put it in my backpack, telling the guy to get to a hospital when he feels symptoms. He showed me on his hand where it bit him earlier when first trying to catch it and he was bleeding slightly. Though they are venomous – it affects people differently. They are potentially deadly. He’ll definitely experience pain, and hopefully little necrosis. What a crazy thing to see a reptile hunter collecting snakes and turtles at a Buddhist wat. It was a very sad thing to see him trying to kill the turtle for no reason. Probably the shell is worth something. Many Thais eat turtles too – but I think mostly the soft-shelled water turtles. 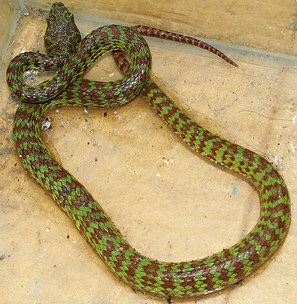 So – I have a Trimeresurus venustus – Gernot Vogel from Terralog “Venomous Snakes of Asia” uses the Trimeresurus prefix. 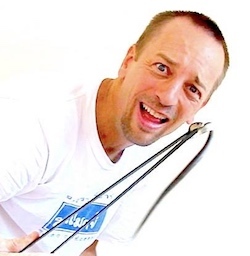 Joachim Bullian uses “Cryptelytrops” instead. Not sure what the real label is. “Venustus” is correct anyway. Brown Spotted Green Pit Viper is the common name for it. They enjoy limestone areas and are frequently found on the ground according to Bullian – but, I’ve found them in bushes during the day – sleeping. They are very slow during the day – and not all that much quicker at night. I took this one home and put it in the tank. It appears to be gravid – hope she is able to give birth (ovoviviparous) soon. That’d be awesome to see. Previous Previous post: Thailand Herping Trip – Again, Almost Skunked!